Since my diet (new healthy lifestyle) began, I have completely sworn off candy, cakes, ice cream, cookies and anything that has a lot of calories and sugar. I have made adjustments though so I can eat certain sweets as long as they are made out of healthy ingredients like oatmeal, fruit and peanut butter. I normally have to cover my peripheral vision when walking through the seasonal, ice cream and cookie aisles at the grocery store to avoid temptation, but I have a mental block in my mind that I simply don’t want to eat junk, so I can look at it and not care about it. Valentine’s Day was yesterday and I went to the store with the intention of buying some junk food because one day is not going to ruin my weight loss progress. 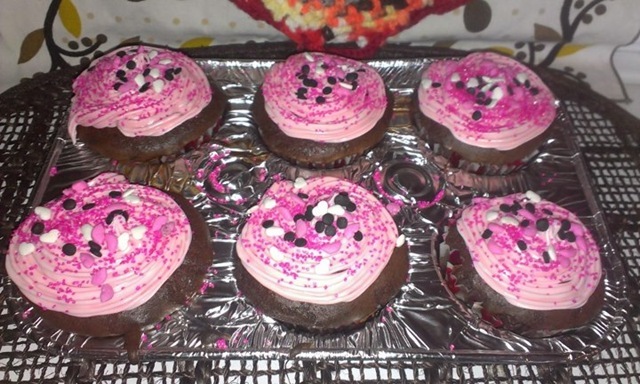 I didn’t find anything that I liked, so I bought the Valentine’s Day disposable cupcake tins with cupcake paper cups with hearts on them and some cupcake sprinkles. I went to the cake aisle and I was going to buy the sugar free cake mix and frosting, but they we’re both sweetened with Splenda. Most people would grab those because they have less calories, but I didn’t because Splenda gives me mad cramps in my stomach and I just can’t handle that. I bought the Duncan Hines white frosting with a packet of Strawberry Shortcake flavor to mix in and a box of Betty Crocker chocolate cake mix. That made 24 cupcakes. I gave 1 of the trays to our tenant because they have 3 people living there, so they each got 2 cupcakes. They were thrilled. Besides eating cupcakes all day long, which I only had 6 (YIKES I know, right? ), I also ate some chocolate covered strawberries which I had to skewer and freeze so I could dip them into Magic Shell chocolate which hardens when it comes in contact with something as cold as ice cream or say frozen Strawberries. Those were good. We actually still have a bunch of them in the fridge. Of course I wasn’t a bad boy all day, I had my regular healthy bowl of cheerio’s with 1 banana and some soy milk for breakfast and my weight watchers frozen dinners for lunch and dinner. I am allowed to have 3 snacks throughout the day, so I exchanged my healthy snacks for the cupcakes and the chocolate covered strawberries. My day wasn’t a total bust, I only went over my calorie budget by a little, so I technically still had a good day. I weighed myself when I woke up and my weight didn’t go up, it actually went down. Although it will probably take a day before the cupcakes kick in, so I will just have to be extra good until my next cheat day which will be my birthday. I don’t plan on cheating at all during Easter since I don’t celebrate it despite how much I love Cadbury eggs lol. I will resist temptation since I have a mental block on it.